An adaptation of the classic novella, Storm Boy tells the story of Michael, a young boy growing up in a shack with his father on the starkly beautiful South Australian coast. After hunters kill their mother, the boy takes in three newborn pelicans, raising them with the help of his father and another outcast, an indigenous man named Fingerbone Bill. Storm Boy is a simple story, elevated by the performances of its central cast and beautiful visuals. The debut performance of Finn Little as the titular Storm Boy is especially good, as he comfortably and naturally interacts with older actors (both human and avian). 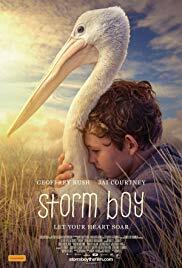 Nostalgia may play a part in your appreciation of the movie, and the addition of a present day framing device with Geoffrey Rush as the character as an older man seems largely unnecessary, but Storm Boy is a lovely, intimate film and definitely worth seeing if you fondly recall either the book or original film.